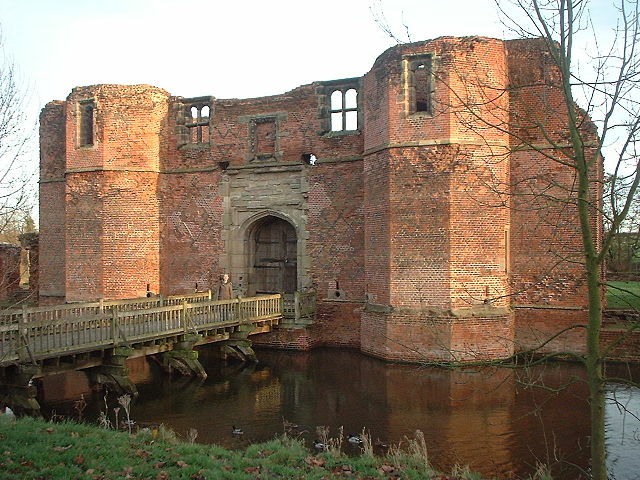 Kirby Muxloe Castle is a red-brick fortified mansion in Leicestershire, England. It was left unfinished and fell into decline soon after its abandonment. 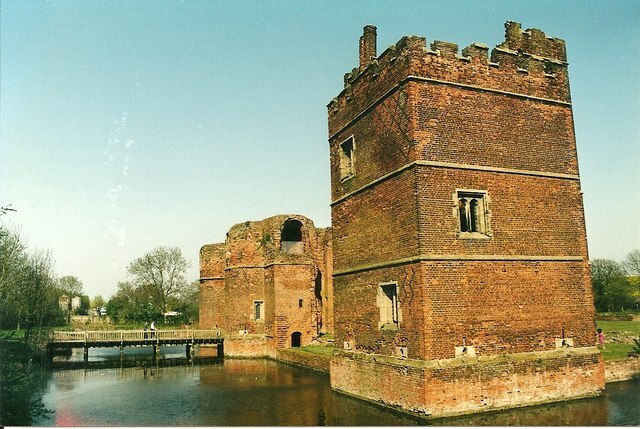 Construction began in 1480 on the place of an older moated manor house. However, the ambitious plans and dreams of its owner, William, Lord Hastings, were not completely made a reality. In 1483, he was surprisingly seized and executed without trial for treason by Richard, Duke of Gloucester (later Richard III). It seems that with his death, the unfinished mansion died as well. However, some finished parts survived the passage of time. They still stand proudly and radiate with a divine beauty. 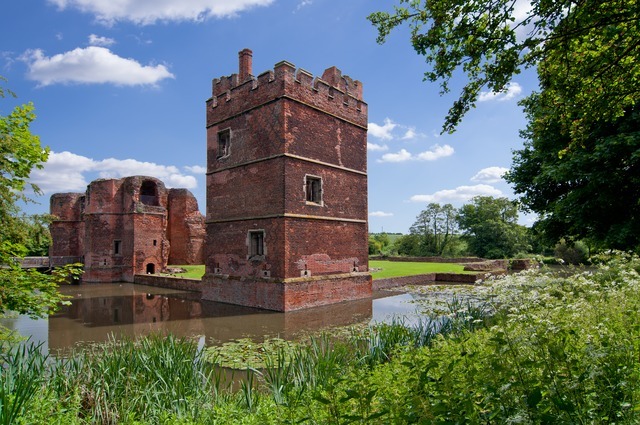 The ruins are nestled on a moated rectangular “island” that is surrounded by a 60-ft wide moat. The “island” is revetted with walls of brick. The moat is filled with water by a 360-ft long channel that connects with a stream placed to the south of the castle. 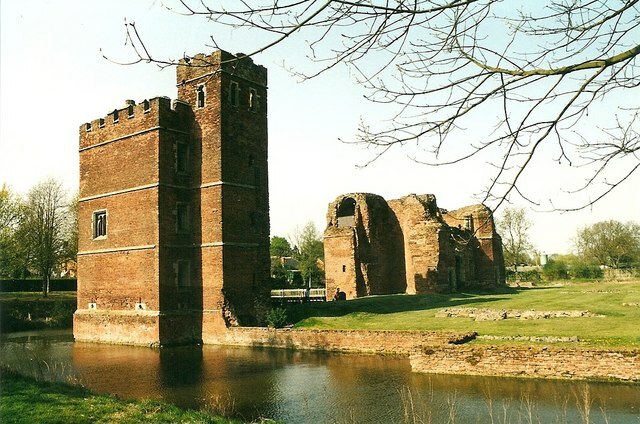 The magnificent gatehouse and one of the corner towers (the west tower) are the site’s main attractions. The gatehouse is reached by a bridge, reconstructed in 1912/1913 as a replica of the old bridge. 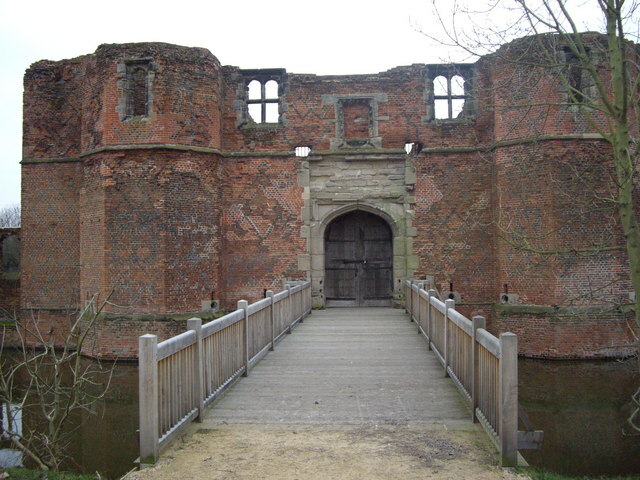 Originally, there was also a drawbridge and a portcullis on the entrance to the gatehouse. The tower is three floors high and has a brick spiral staircase that leads to the top. 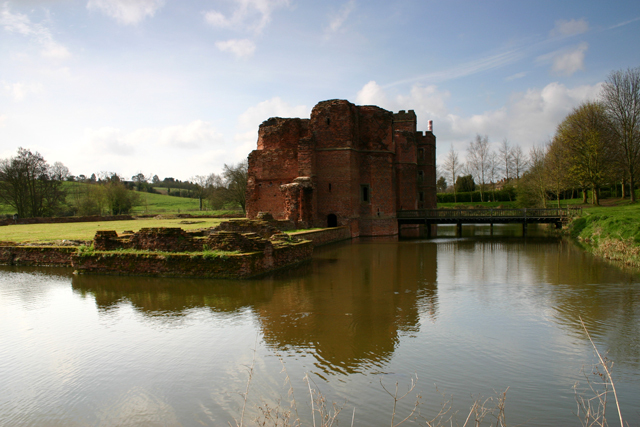 In 1460, the Hastings family inherited Kirby Muxloe estate. During the construction of the castle, Lord Hastings pulled down great parts of the original 14th-century house, which was constructed by the Pakeman family, and used the stone for the foundations of the new structures. The foundations of the hall of the older manor house, as well the foundations of its pantry, buttery, and passage to the kitchen, can be seen within the courtyard of the new quadrangular 15th-century castle. 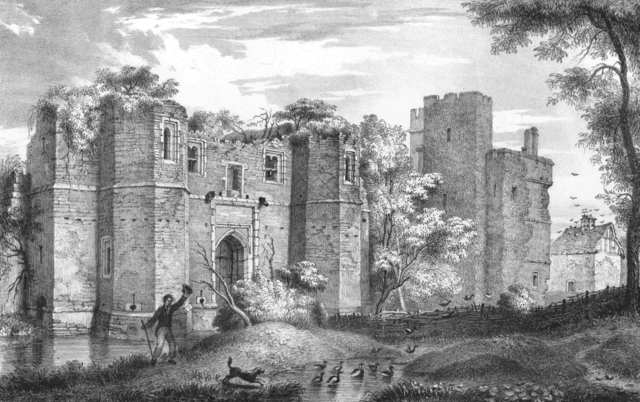 The construction work at Kirby Muxloe was part of a larger construction project that Sir William Hastings undertook in order to renovate and fortify his residences in Leicestershire. 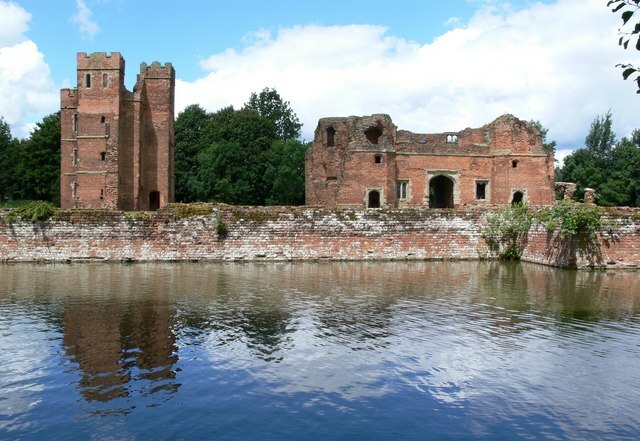 He got permission from Edward IV to crenelate Kirby Muxloe in 1474. The reconstruction started six years later under the supervision of John Cowper, the master mason; and Roger Bowlott, the project’s clerk of works. Unfortunately, after the unexpected death of Edward IV, Lord Hastings was beheaded by Edward’s brother, Richard, Duke of Gloucester (the future Richard III). Lord Hastings was a supporter of Edward IV; he was also a friend of Richard and supported his claim to the throne. The reasons why Richard executed Lord Hastings are not quite certain. Some historians believe that Hastings was killed because Richard (then, Lord Protector of the realm for the young king, Edward V, the son of Edward IV) suspected that Hastings would stand against the removal of the throne from Edward V.
It is also possible that he was killed because he refused to support Richard’s plans to kill the 12-year-old Edward V and his 9-year-old brother. The brothers are known as the Princes of the Tower, and their fate has never been solved. His death stopped the further development of the castle. His wife continued the work, but in less than a year of sporadic construction, she abandoned the project. 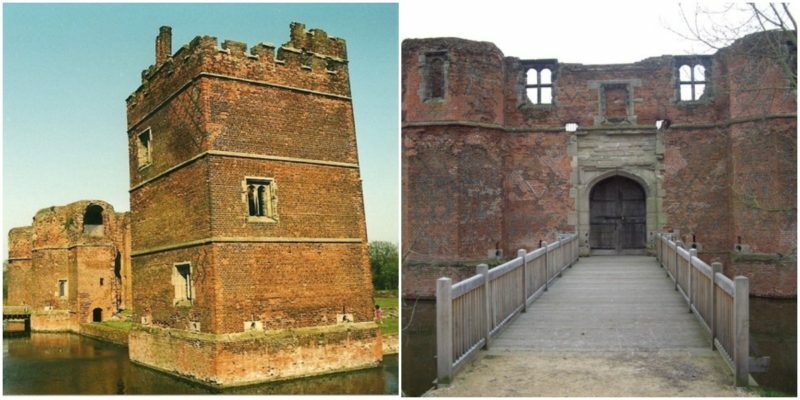 Great parts of the foundations were finished, the gatehouse was largely constructed, and the west tower was finished almost to plan. But everything stopped there. Soon, the unfinished castle was abandoned and started to decay. Thankfully, the standing remains clearly portray the layout of the castle. Except for the stone dressings, the structures were constructed with locally-produced red bricks. Until 1911, the site was used as a farm. That year, the Office of Works took care of the site. In 1912/1913 the site was for the first time preserved and cleared of overgrown vegetation and debris. The original accounts book says that Lord Hastings spent £1088 pounds ($1430) on the construction work. The accounts book also clearly shows that the towers were planned to carry artillery. But, despite the moat and the towers, it is obvious that the fortified mansion was not built to be a mighty fortress that could withstand strong military attacks. It was constructed in such a way that served only to show the owner’s wealth and status. The planned placement of early gunpowder artillery was likely to be only a measure of caution to put fear on the local tenants and stop them from attacking the castle in the event of a rebellion. This picturesque ruins, located approximately 4 miles west of Leicester, are well preserved and maintained by English Heritage. The site is open for public visits, but has limited opening times, and provides a magical journey into the past. 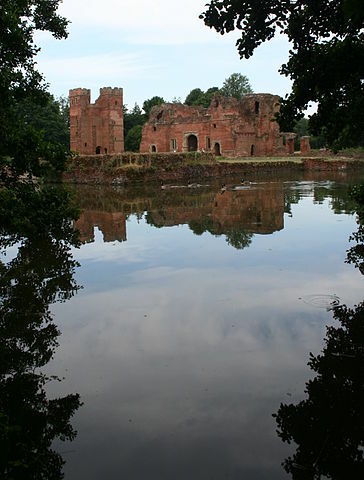 The unfinished structures of Kirby Muxloe Castle are some of the earliest brick structures in the Midlands.